Live in the Washington D.C. region and want to watch the Air Force Falcons up close? 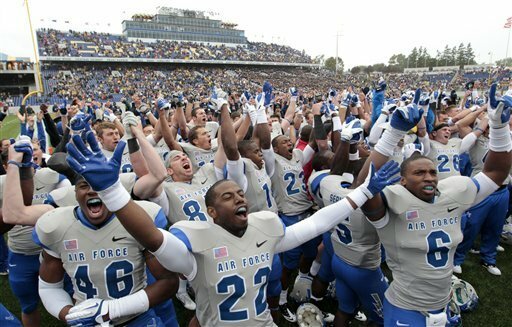 Air Force coach Troy Calhoun keeps his team’s practices open to the public and with the team playing in this year’s Military Bowl, Calhoun will relocate Air Force’s practices to D.C. for four days starting Dec. 23. The team will use the fields at St John’s College High School, which is on the D.C.-Maryland border by Chevy Chase. Calhoun’s policy of keeping practice open to the public flies in the face of most NCAA coaches, who close practice for fear of other teams sending scouts. Yet somehow Calhoun keeps winning games. Maryland football coach Randy Edsall, whose team practices down the road from St. John’s, keeps his practice closed. His team won only two games this season. Calhoun might be on to something. Take note, Edsall. Friday, Dec. 23, 3:15 p.m.
Saturday, Dec. 24, 2:45 p.m.
Sunday, Dec. 25, 12:15 p.m.
Monday, Dec. 26, 12:00 p.m.